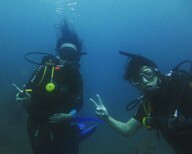 This scuba diving course in Bali takes you to the gorgeous dive spots near Amed in Bali. 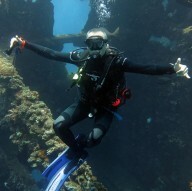 These dive spots, with minimal ocean current and moderate water temperatures, are perfect for testing advanced scuba skills at easy dive spots. The most well-known locations in these waters include the Jemeluk Bay, a shallow and rich coral garden, the Jemeluk Wall, an impressive abyss in the Bali Sea, and the Deep Blue, a shallow bay of coral boomies. From barracudas and moray eels to black tip reef sharks and sea turtles, these dive spots of Amed feature a widely diverse marine life.